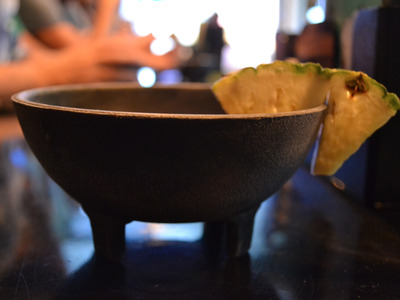 Emma Rechenberg/Business InsiderMy bowl of kava was served with a wedge of pineapple. Some adventurous eaters are starting to swap out their happy hour cocktails for something a little more natural. 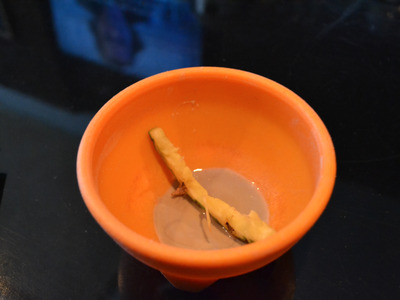 Kava drinks — often referred to as “kava tea” — are made from the roots of a plant grown in the South Pacific, and they’re known for their purported anti-anxiety and anti-depressant effects. Basically, the drink mimics alcohol’s relaxing and sedative effects without the downsides — no extreme emotions, no memory loss, and no hangover. Tech Insider previously reported on kava’s key compound, kavain, which mimics a sedative and triggers relaxation in the body. It works as a muscle relaxer, so while you’re mentally alert, you feel physically loose. 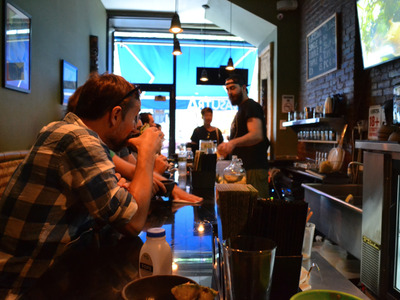 The drink has made its way to the US, and is now being served at six KavaSutra bars across the country. 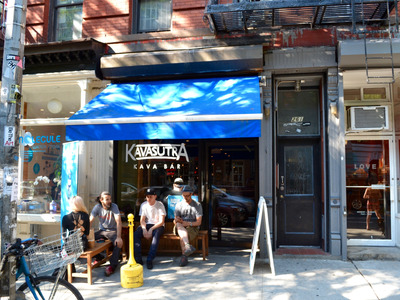 Last Friday, I stopped by the New York City location to see if this magical drink was worth the hype. The outside looks like any other bar. I arrived at around 4:45 pm, shortly before happy hour was set to begin. 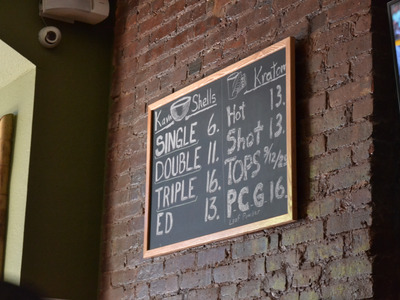 I met with the bartender, Moose, who helped me through my first kava experience. 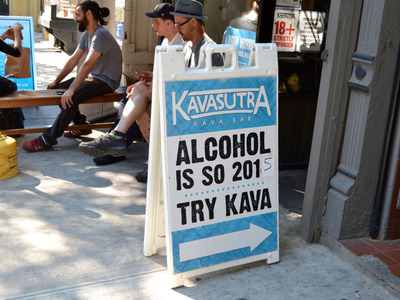 He's been drinking kava for well over a decade now, making him the perfect guide. Moose explained to me that it may take a while to feel kava's effects. It's different for everyone, depending on how quickly your liver enzymes metabolize the kava juice. 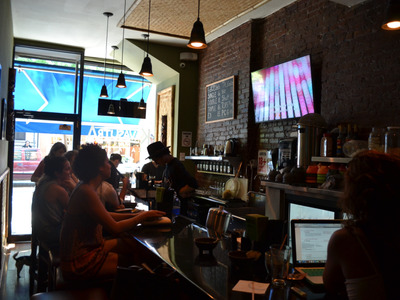 The atmosphere was calm and relaxed, unlike other bars you'll typically find in New York City. The decor is tropical in homage to kava's island origins. You'll find customers working on their computers or socialising with friends at the bar. 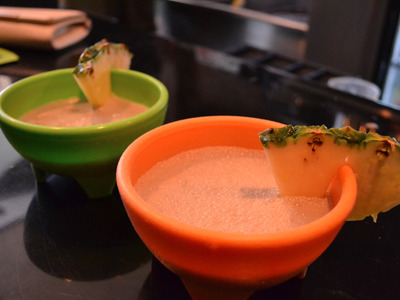 Happy hour is everyday from 6-9 p.m -- kava shells are half off at that time. 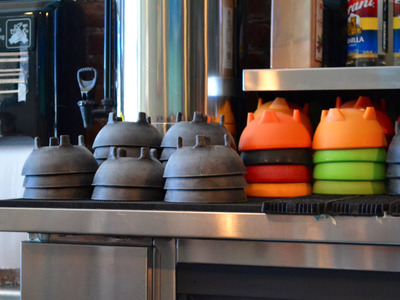 Kava is served in shells, some more colourful than others. Once the drinks are poured, everyone raises their shells and cheers with the Fijian word 'Bula.' This means 'to live' and seemed fitting for how peaceful guests appeared to be at the bar. If you're looking to cut some calories, you're in luck. Moose said that each kava serving has 'next to nothing' when it comes to calories. The drink averages about 30 calories per serving. Because the drink is natural, no flavoring or sugar is added to the traditional shells. Moose also said that kava is not addictive, however, he did recommend preparing for the drink like you would before drinking alcohol -- have something in your stomach, and know your limits. 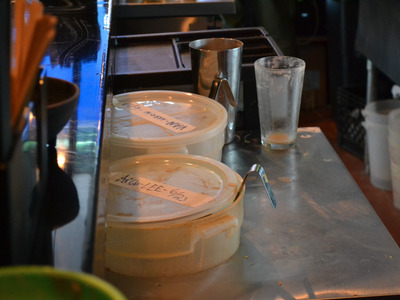 The recommended kava consumption depends on the individual. Moose explained that the root has a reverse tolerance effect, meaning that the more often you drink kava, the fewer drinks you need to feel its effects. I ordered the Ed, which is recommended for first-timers. The drink combines highly concentrated powdered kava and 6 oz. of the liquid kava. It's a little stronger than the single and double shell servings, which means you're more likely to feel kava's effects the first time you try it. The drink was light brown and looked like murky water. A layer of foam coated the top of the drink, and I soon realised that kava doesn't look or smell very appealing. The drink was chalky and tasted the way I would imagine dirt to taste. I relied heavily on the pineapple for some sweetness to push the drink down. After the first round my lips started tingling, but despite the unique sensation, I found myself beginning to relax. Moose said that customers come by for different reasons. Many are first-timers curious to see the drink's effects. Some are regulars stopping in for their daily fix. Moose said he has even met some people using kava to recover from alcohol or drug abuse. I found a few online forums where people discussed whether they found kava to be helpful or harmful in their recovery process. Moose explained that this bar is much calmer than any bar he's ever worked at before. He said there are no bar fights here -- only friendly conversation between customers. 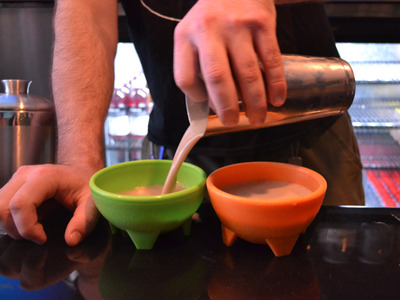 Kava can be served in a variety of forms. I tried two kava shots -- mangos of madness and kava sunrise. 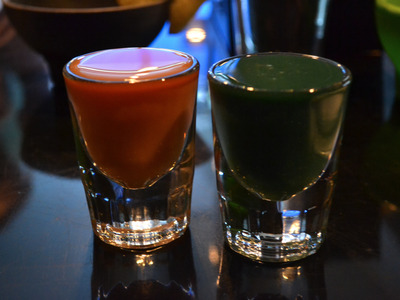 The shots were more flavorful than the traditional liquid kava juice. They tasted similar to a blended fruit juice, with a slight medicine-like aftertaste. After I drank down the kava shells and shots, I was feeling pretty relaxed. I'm not sure if that had to do with the kava or the fact that it was Friday and I had minimal responsibilities scheduled for the weekend. Despite not having a hangover, I don't think I'll return any time soon. The taste was a little too strong for my liking. At the next happy hour I attend, I'd prefer to sip on something that doesn't taste so much like earth.